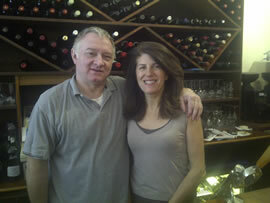 Alex and Polka Rastovic have owned Crispins wine bar for thirty years and have naturally become a central part of the local community. 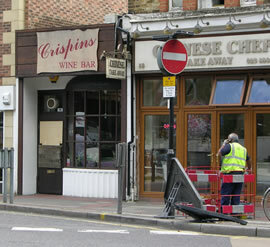 On the night of the riots, despite the wine bar being closed under advice from the Police, Polka was on the premises when the doors were knocked in. She described the shock and anger at the mindless violence and burning cars outside and how she took refuge by locking herself in the kitchen along with her son. The aftermath was a carnage of broken glass and wine soaked decor with spirit stocks ravaged. However Polka and Alex are made of stern stuff and the very next day, with help from many locals who turned up to help, set about clearing up, repairing and restocking. Polka says "the best way is to show them they can't win". Boris Johnson met them and pledged support during their clear up operation and by Thursday night they opened their doors once more with the same hearty smile. Both Alex and Polka have received calls of support from around the globe, even as far as Japan from people they haven't spoken to for 15 years, offering concern and support. They would both like to to say a huge "thank you" for all the support and help they have received from friends, locals and the council. The club house is open once more so to speak, and Crispins offer a very warm welcome to all.